Ready for a mountain of flavor? 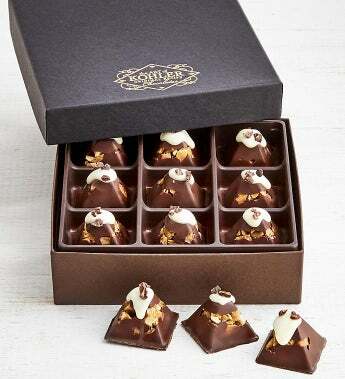 Crafted with hazelnut toffee and dark chocolate, these white-capped mountains from famed Kohler are topped with cocoa nibs and deliver layers of delicious chocolate taste. Stunning to look at - and a pleasure on the palate! Kohler Original Recipe Chocolates began in 2003 at the world renowned Kohler American Club® Resort. Herb Kohler, Kohler Co. Executive Chairman, believed the world deserved something better than a run-of-the-mill turtle and worked with the famous Chefs of The American Club® to develop the premium quality Terrapin that met his demanding requirements for limitless opportunity in taste and texture while honoring a single level of quality and a definitive chocolate experience.